There's nothing wrong with having a diet mostly comprising carbonated drinks and cheese-puffed snacks. Whoever said that fruits and vegetables were essential to a well-nourished diet was seriously disturbed. All you really need to function properly is some caffeine and cheesy sustenance and you'll be good to go. Skateboarding, video gaming, and channel surfing, basically the most exciting activities that are out there can all be fueled by the best soft drink on the market...Mountain Dew. You don't have to tell us how addicting the lime green beverage is. If we could, we would carry around a keg full of it so we could fill up with Dew throughout the day. If you feel like we do, we guess that we don't need to stress that you should really "dew" this costume for Halloween! This Mountain Dew can costume is shaped like a cylinder, but it's actually a tunic that you can wear. Just put your head through the top hole and stick your arms through the holes on both sides. 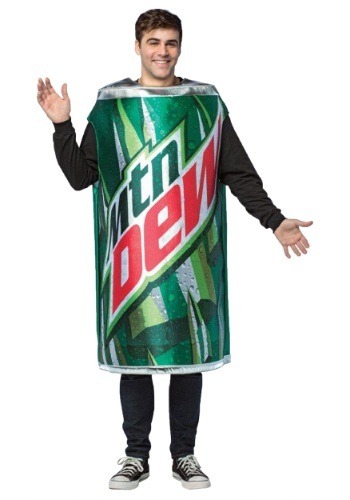 The costume is modeled to look like the present day Mountain Dew can with condensation running down the sides. Don't be surprised if parched people start chasing you while you're wearing this mouth-watering costume!